Lately you’ve noticed your pet has been scratching and biting a lot. Then, while you’re cuddling with them, you see a tiny creature moving quickly through their fur. Your pet has fleas! Fleas are small, blood sucking insects that are found all around the world. Most of us think of dogs and cats as a flea’s primary host, but they can target any warm blooded animal, including rabbits and pocket pets. Fleas spend their adult life feeding on your pet, and their larval and pupal stages on the ground or in your carpet and furniture! 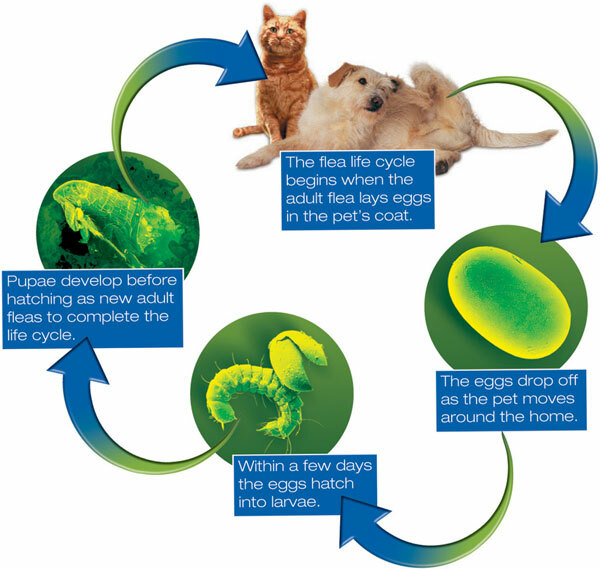 Adult fleas feed and lay eggs on your pet. An adult flea lives for about 2 – 3 months. The eggs fall off your pet’s fur as they move, spreading them around a large area. Larvae hatch in 2 – 10 days. After feeding and growing for 2 – 3 weeks, they spin a very strong and protective cocoon. The fully grown flea can emerge in as little as five days, but can remain in the cocoon for several months! Why is that? The adult flea is quite happy to wait in its safe cocoon until a suitable host walks by. They will also remain in their cocoons during winter when temperatures are too low to survive. Finally, when conditions are just right, they pop out and jump onto your unsuspecting pet! How can you protect your pet from fleas? The best way to keep your pet flea free is by using a flea prevention product from your veterinarian. The products we recommend have been through extensive testing to make sure they are safe and effective for your pet. Once you have treated your pet, reduce the larvae, pupae and eggs in your house by vacuuming, and by washing bedding frequently. Since the pupae can survive in their cocoons for several months (some sources say up to a year! ), it is important to keep treating your pet monthly to prevent re-infestation. (not so) Fun facts about fleas! Just two fleas can multiply to 1,000 fleas on your pet and in your home in 21 days. Fleas can carry tapeworm larvae and infect your pet when ingested.